Al-Qaeda in Iraq [Tanzeem Qaedat al-Jihad Fi Bilad al-Rafidayn], in two separate statements, condemns the killing of an Imam from the Wisam al-Dowri Mosque, purportedly by the “crusaders and their helpers, the Alkami (Shi’a),” and refutes claims that 40 mujahideen were captured in western Iraq. In a second wave of communiqués issued today, June 9, 2005, al-Qaeda in Iraq, in two separate statements, provides further details of the attack in al-Zeidan near Abu Ghraib, west of Baghdad, targeting Iraqis and Americans, and lists of several attacks executed in al-Ramadi, this past Friday, Saturday, and yesterday. 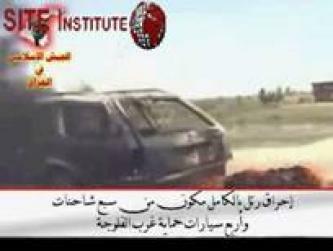 In a communiqué issued today, June 9, 2005, and subsequent 7 minute video, the Islamic Army in Iraq claims responsibility for an attack in al-Khalidya, an area west of Fallujah. Al-Qaeda in Iraq [Tanzeem Qaedat al-Jihad Fi Bilad al-Rafidayn] issued a communiqué today, June 4, 2005, claiming responsibility for an attack yesterday upon a “center (precinct) of the police forces supporting the Jews and Christians” in the city of Samarra, north of Baghdad. 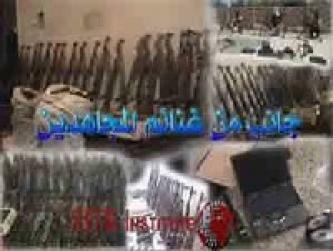 A four minute audio message issued to the Internet today, May 31, 2005, allegedly voiced by the Emir (Prince) of the Martydom Division of al-Qaeda in Iraq, Abu Dajana al-Ansari, acknowledges the establishment of the al-Baraa Ibn Malek Martyr’s Brigade and reports their assault on the “infidels’ buildings” Sunday, May 29 in Baghdad. In a series of communiqués and a 2 minute video, al-Qaeda in Iraq, claims responsibility for today’s assassination of Majoral General Wael al-Rubaie and his driver, bombings in Mosul, also today, and responds to “crusaders” attack upon Muslim homes in Abu Ghraib and claims that a leader of the group had been captured. Two statements issued today, May 13, 2005, al-Qaeda inIraqthrough its official spokesman, Abu Maysara al-Iraqi, addresses the arrest of imams and describes their most recent operations in al-Qaim, western Iraqi near the Syrian border. Also, in a separate message posted to the Internet, al-Qaeda in Iraq provides a thirty second video clip depicting bombings on a Humvee and armored personnel carrier. Al-Qaeda in Iraq issued six separate statements during the weekend claiming responsibility for attacks against American and Iraqi forces from Saturday, May 7, 2005 through May 8. Below is the full translation of the audio message issued on the Internet April 29, 2005, allegedly from Abu Musab al-Zarqawi, the emir (prince) of al-Qaeda in Iraq. Al-Qaeda in Iraq released a communiqué on Tuesday, April 26, 2005, claiming responsibility for an ambush against American forces in Ramadi. The Islamic Army of Iraq is claiming responsibility for the downing the commercial helicopter north of Baghdad this morning. Al-Qaeda in Iraq posted four statements detailing their attacks in last 24 hours. In a recently issued statement and accompanying video, al-Qaeda in Iraq detailed an operation that took place in Tikrit on Thursday, April 14, 2005, claimed by the group to be a complex housing for FBI, Israeli Mosad, Kurdish Bishmarka, and Special Forces officials. The Rafidan Political Committee of the Mujahideen Central Command posted a 6 minute video on the internet. On April 5, 2005, the Iraqi insurgency group, Ansar al-Sunna released a communiqué and 3.5 minute video depicting a “confession” and subsequent execution of a man charged with aiding American forces against the mujahideen. 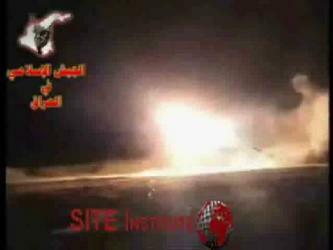 The Islamic Army of Iraq issued two communiqués claiming credit for launching seven Grad rockets. According to the communiqués, four rockets were fired at an American base in al-Mahmoudia, and three at the location where the Iraqi General Assembly convenes. As the Ansar al-Sunnah Army promised on March 21, 2005, they released the full version of their new promotional video called Self-Satisfaction, along with a communiqué on the Internet eight days later. The group is believed to be an offshoot of the al-Qaeda affiliate Ansar al-Islam.